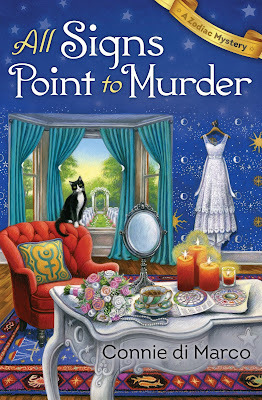 You can follow the All Signs Point to Murder Blog Tour here. Hi Kim ~ Great to be visiting with you today! Thank you! Congrats and best of luck on your upcoming release! Thanks for the excerpt and giveaway. Thanks for stopping by and checking Connie's upcoming book, All Signs Point to Murder. Good luck in the giveaway. Hi James ~ Thanks so much! And best of luck in the giveaway! I own the first book in the series and I believe I gave it 5 stars on Goodreads. I'd love to add the second one to my home library to share with my family (all readers). I'm so glad to hear you enjoyed The Madness of Mercury, Nora-Adrienne! And thanks so much for reviewing too! I hope you get to follow Julia in her next adventure soon! Thanks for sharing the excerpt, it sounds like a great book! Hi Victoria ~ You're very welcome. I'm glad you enjoyed it. Best of luck in the giveaway too! Thanks for stopping by! I love Connie's writing. Oops, I posted in the wrong spot, see below, Linda. Thanks for stopping by. I hope you get a chance to read Connie di Marco and Connie Archer. Love them both. Hi Bernie ~ you know, there are so many I love, it's hard to say. I love to go into bookstores and look for an author I've never heard of and just about every time, I'm delighted with what I find. I discovered Zoe Ferraris and her Saudi Arabia series that way, but recently, I have to say Karen Dionne, Tana French, and lots of others! Hi Linda ~ Thanks for visiting today! I hope you get to meet Julia soon and enjoy her adventures! Kim ~ thanks again for hosting me today! You are more than welcome. I love having you on the blog! I'm so glad you're busy as ever in your new location! Thanks for the excerpt and giveaway. This series sounds really good. Hi Nancy, thanks for visiting. I hope you get to meet Julia soon! Hi Nikolina ~ I'm so glad you're enjoying the tour! Best of luck! Hi Della ~ thanks for visiting! I hope Julia will have a lot more adventures. Hope you get to enjoy this one! Good luck! Great synopsis and love the cover art! Can't wait to read the book! Hi Jennifer, thank you! Best of luck in the giveaway! I haven't read the Zodiac Mystery series yet but I'm going to add it my list of new series to check out. Thanks for stopping by. I hope you'll enjoy Julia's world and all her adventures. Wishing you a Saturday full of fun and thanking you for the chance at winning. Sunday blessing to you and thanks for all you do bringing us these great giveaways. Have a terrific Monday and thanks once again for the chance at winning. Thank you once again for taking the time to bring us such great giveaways. I really appreciate it! Thank you so much for offering us the opportunity to win this giveaway. I sure am late tonight but better late than never to thank you again for the opportunity to win. Have a terrific Friday evening! Hope your weekend is starting off terrific! Have a fun one and thanks again for bringing us these great giveaways. Happy Monday and have a great week ahead. Thanks for the chance at winning once again. Hey James! I hope you had a good weekend. Oh. Monday. Sigh. Good luck in the giveaway. Hello! Sure hope you are not tired of hearing from me for my daily entries. I DO appreciate the opportunity you have given us to win Thanks so much! Hey James! You make me smile. Thanks for stopping by everyday.